IBM® Rational® Developer for i provides an integrated development environment (IDE) to create, maintain and modernize applications on the IBM i platform. It integrates developer tools such as search, edit, build and analysis, refactoring capabilities and debuggers with the widely used Eclipse framework for faster, easier application development and modernization. Rational Developer for i integrates with IBM Rational Team Concert™ for better application lifecycle planning and management. Enable developers to work in both host-connected and disconnected modes using tools that reside on the developer’s desktop. Support various approaches to RPG and COBOL application modernization. 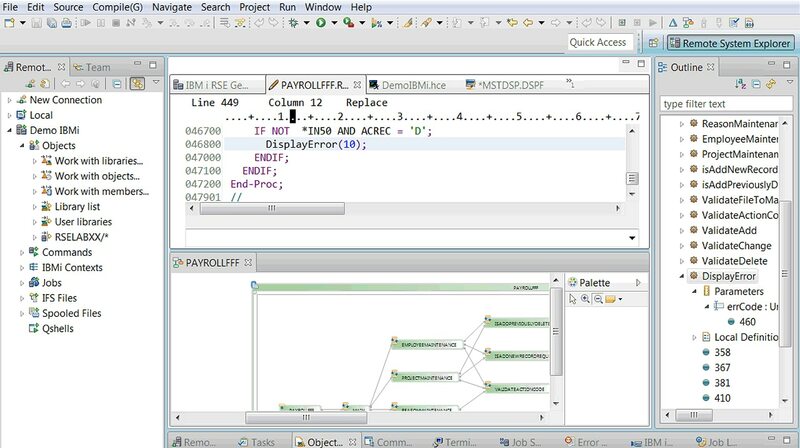 Use system i tools with the widely used Eclipse framework for faster application development. Choose from three product editions: RPG and COBOL Tools; RPG and COBOL + Modernization Tools, Java Edition; RPG and COBOL + Modernization Tools, EGL Edition. Try how effectively Developer for i creates and maintains applications on IBM i systems. Create, maintain and modernize applications on IBM i.